ColoradoAvalanche.com profiles the players named to the Avalanche's 20th Anniversary Team. The first goal scored by the Colorado Avalanche came from the stick of Valeri Kamensky on Oct. 6, 1995 at McNichols Sports Arena. Kamensky found the back of the net two times that night against the Detroit Red Wings, helping the Avalanche get its first victory in the Mile High City. The Quebec Nordiques selected Kamensky in the seventh round (129th overall) of the 1988 NHL Entry Draft. However, he played professionally in Russia through the 1990-91 campaign. He was chosen to the USSR First All-Star Team in 1990 and 1991 and was named the USSR Player of the Year for 1990-91 season after tallying 46 points (20 goals, 26 assists) in 46 games. In his first four years with the Nordiques, the Voskresensk, Russia, native accumulated 153 points (60 goals, 93 assists) and a plus-27 rating in 171 contests. 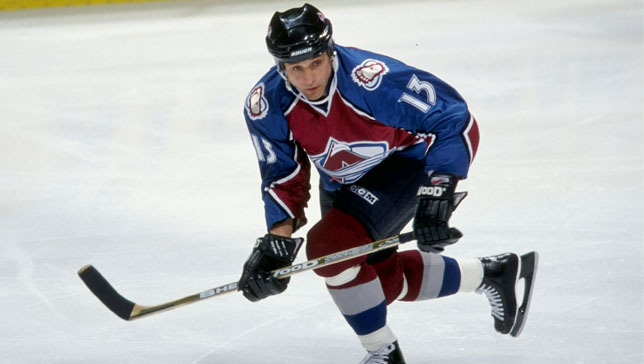 During the 1995-96 Stanley Cup-winning campaign with the Avs, Kamensky registered 85 points (38 goals, 47 assists), five game-winning goals and lit the lamp 18 times on power plays in 81 games. The forward skated in 22 contests that postseason and recorded 22 points (10 goals, 12 assists), a plus-11 rating and two game-winning goals before raising the Stanley Cup. As the club was defending its title in the 1997 playoffs, Kamensky logged 22 points (eight goals, 14 assists) in just 17 games. He then went on to register 66 points (26 goals, 40 assists) during the 1997-98 season, making his only NHL All-Star Game appearance. Kamensky recorded 44 points (14 goals, 30 assists) in his last campaign with the Avalanche in 1998-99. A broken forearm caused him to miss the last 15 regular-season games and the first nine playoff contests. The forward came back from the injury to skate in 10 postseason games, registering nine points (four goals, five assists) and a plus-5 rating. Of his 11 years in the NHL, Kamensky skated with the Avalanche/Nordiques organization for eight of them. He is 10th all time for the franchise in points (413), assists (248) and game-winning goals (22), and seventh in goals (166) and power-play goals (51). Kamensky is also tied for sixth on the organization’s all-time hat-trick list with five, two of which came during the inaugural season in Denver (Dec. 5, 1995 and March 20, 1996). The left wing made two appearances at the Olympic Winter Games, winning a gold medal with the Soviet Union in 1988 and a silver medal with Russia in 1998. Kamensky also helped bring gold home to the Soviet Union at the 1986, 1989 and 1990 IIHF World Championships. After earning Olympic and World Championship gold medals and the 1996 Stanley Cup, Kamensky became one of 26 members of the prestigious Triple Gold Club. Kamensky will be recognized, along with other members of the Avalanche 20th Anniversary Team, in a special pregame ceremony prior to Colorado facing the Minnesota Wild on Dec. 7.